Director/Photography – Peter Hyams, Screenplay – Mark Verheiden, Story – Mark Verheiden & Mike Richardson, Producers – Moshe Diamont, Sam Raimi & Robert Tapert, Music – Mark Isham, Visual Effects Supervisor – Gregory L. McMurray, Visual Effects – VIFX, Special Effects – Thomas Special Effects (Supervisor – John Thomas), Production Design – Philip Harrison. Production Company – Largo Entertainment/JVC Entertainment/Signature/Renaissance/Dark Horse. In 1994, a private Senate committee is told that time-travel is now possible. A new police force, the Time Enforcement Corps, is set up to ensure that there is no meddling in the timeline. Police officer Max Walker enlists in the TEC after his wife Melissa is killed. In 2004, Max discovers that Senator Aaron McComb is meddling in the timeline, trying to get his younger 1994 self not to sell his shares in an unstable computer firm that will become an industry leader in a few years time. McComb needs the money to finance his faltering election campaign for Presidency in the present. McComb has corrupted a number of TEC operatives. In trying to stop him, Walker finds that the timeline has been changed so that he no longer exists. Perhaps it was the Jean-Cluade Van Damme name above the title on the poster but one went into Timecop with little in the way of expectations, assuming that it would merely be a mindless action vehicle that involved Van Damme throwing his feet about in previous historical eras. To some surprise, Timecop is more than that – in fact, one might say it is for Jean-Claude Van Damme what The Terminator (1984) was for Arnold Schwarzenegger, allowing the action star to immerse his persona inside a tightly plotted vehicle. In some places, Timecop was being billed as Jean-Claude Van Damme’s first stab at serious acting. 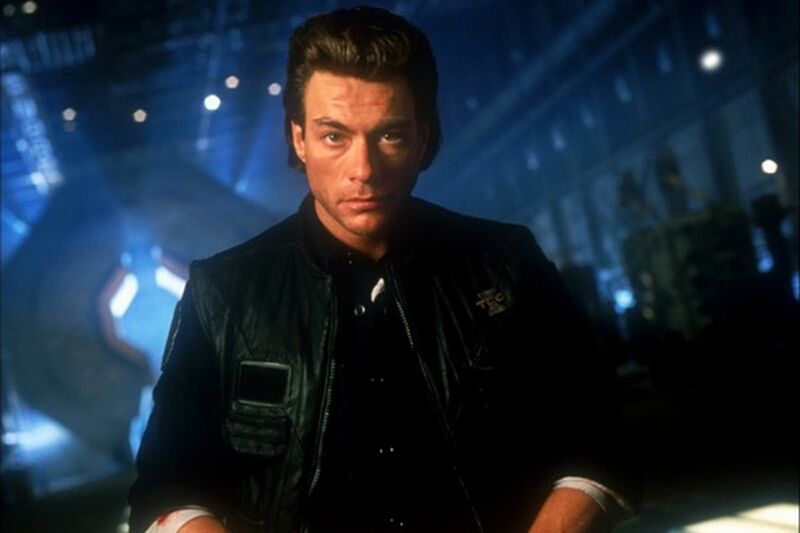 And, although Jean-Claude Van Damme and the word acting should never be used in the same sentence, Timecop perhaps comes the closest he has come to doing so yet. The film has its requisite level of martial arts punch-ups but the action element never gets in the way of the sharp and intelligent script. In fact, the script did not need to be sold as an action vehicle – although one supposes that that is the way films have to be promoted these days. The plot has an ingenious number of twists. The most effective of these are those that centre around the time editing, like when Jean-Claude Van Damme returns from the past to find the TEC operation all but disbanded, his best friend not knowing him, McComb ahead in the Senatorial race and there no record of his fellow agent; and, most intriguingly, the ending where Van Damme returns home to his wife and a son, to a life of ten years that he has never lived. Screenwriter Mark Verheiden, a comic-book writer who also wrote same holiday season’s The Mask (1994) and later a producer/writer on tv’s excellent revival of Battlestar Galactica (2003-9) and a number of other shows including Smallville (2001-11), Heroes (2006-10), Constantine (2015) and Daredevil (2015-8), makes the script work exceedingly well and exceedingly consistently. (In the quibbles department, one kept wondering what happened to the high-speed vehicles and all the excess velocity that suddenly vanished when people went through the time barrier). Ron Silver, as always, plays well, doing a good variation on his frequently wheeled out yuppie villain characterisation. Timecop was directed by Peter Hyams who has a strong association with genre with the likes of Capricorn One (1978) about a faked Mars mission; Outland (1981), an action film set on Jupiter’s moon Io; the 2001: A Space Odyssey (1968) sequel 2010 (1984); Stay Tuned (1992) about people trapped in a Hell of tv shows; the monster movie The Relic (1997); the Biblical End Times action film End of Days (1999); and the Ray Bradbury adaptation A Sound of Thunder (2005) about dinosaurs and time travel. He also produced the appealing Famous Monsters team-up The Monster Squad (1987). The film was spun out into a short-lived tv series Timecop (1997-8), starring T.W. King as timecop Jack Logan. The series was okay but was cancelled in mid-season due to schizophrenic scheduling. A film sequel was later made as the video-released Timecop: The Berlin Decision (2003) starring Jason Scott Lee. (Nominee for Best Adapted Screenplay at this site’s Best of 1994 Awards).